What's New in the 6th Edition? More intuitive and motivating for students. Illustrates more complex design tradeoffs in the database-design chapters. All example tables collected in an appendix in the text and available online. Larger database based on example schema available online for projects and assignments. All chapters have been revised to reflect the latest advances in technology. Chapter 2 (Relational Model) gives brief introduction to relational algebra. Technical details of the relational algebra and relational calculus are postponed to Chapter 6. Instructors may omit these topics if desired. Chapter 6 can be moved ahead and covered immediately after Chapter 2 for instructors preferring a more traditional sequence. Greater attention to variants of SQL in actual systems. More detail on SQL features. 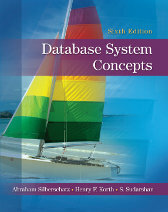 All SQL features covered in the book, including OLAP constructs, JDBC, views, and authorization are included in these chapters. Allows for SQL projects earlier in the semester, leaving time later in the semester for database design/application development. Revised ER notation more compatible with UML. Updated intuitive coverage of normalization motivates subsequent coverage of functional dependency theory. Examples illustrating real world issues in database design. Expanded coverage of security including practical issues in application security. Flash storage systems covered in more detail. B+-tree examples now use n=4, avoiding special case of empty nodes. New material on advanced optimization techniques. Expanded coverage of basics in Chapter 14, providing sufficient coverage of transactions, including both recovery and concurrency, for many introductory courses. Revised and simplified coverage of recovery, with a single algorithm for physical logging that is then extended to allow logical logging, followed by ARIES. Several new examples to illustrate concepts. Database processing on multicore processors. Discussion of consistency versus availability (ACID vs BASE). New material on support vector machines, and validation of classifiers. Moved back to later in the book, since these topics are typically covered only in advanced courses. New material for laboratory exercises. Online appendices, slides for all chapters.